Raise the Dead #2 out today! Hooray! It's an actual Moore & Reppion competition! To celebrate the release of Accent UK's Zombies anthology (OUT NOW!) we're giving away two copies of the book. Since there are two copies of Zombies up for grabs, to make this fair to both arty and non arty types, we'll have two different methods of deciding who gets the book. Q: In which zombie classic did the now infamous zombie vs. shark scene take place? Email answer (marked Zombies competition) to Moore_Reppion@btinternet.com. 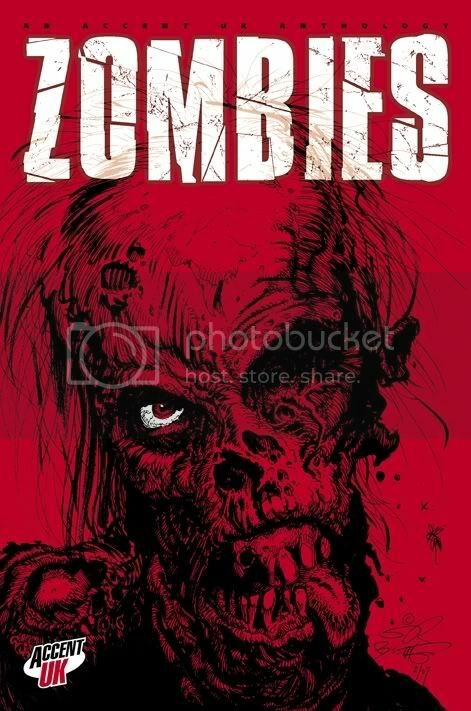 Best picture of myself and/or Leah (or Leah and/or myself... if you see what I mean) as zombies (we don't have to be fighting sharks), posted here in this thread wins the book. There are pictures of us on our Biographies page and probably elsewhere too. You can enter both the arty and the non arty but you can obviously only win one book. The closing date for entries is Tuesday the 5th of June.